China’s wall of cotton is coming down. Once the world’s biggest grower of the crop, the country lost that crown to India in the season that just ended in July after depressed prices discouraged plantings. China’s sowings are set to drop again in the 12 months that started on Aug. 1, with harvested acres poised for the lowest since U.S. government data begins in 1960. 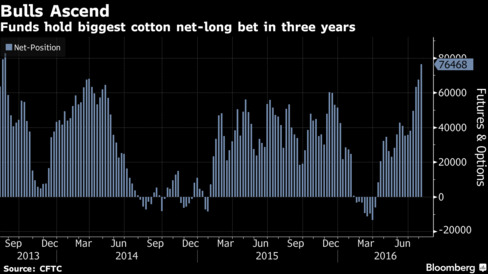 The smaller Asian crop underscores why money managers have increased their wagers on a rally for cotton futures to the highest in three years. Prices have rallied 21 percent this year, reaching a two-year high last week on signs that the global supply overhang is starting to ebb. 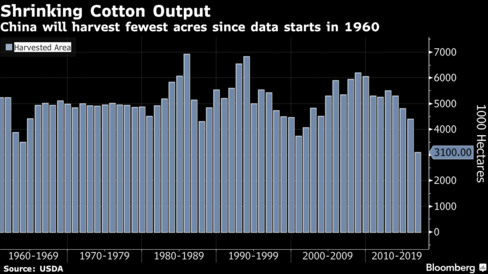 World inventories declined last season for the first time in six years, and the reserves will fall further this year as global harvested acres slump to the lowest in three decades, the U.S. Department of Agriculture estimates. Hedge funds and other large speculators increased their net-long holdings in cotton by 13 percent 76,468 to U.S. futures and options in the week ended Aug. 2, according to Commodity Futures Trading Commission data released three days later. That’s the highest since August 2013. Cotton climbed 3.6 percent last week to 76.74 cents a pound on ICE Futures U.S. in New York. Tightening supplies mean that futures could reach 80 cents by the end of the year, according to the average of 14 estimates in a Bloomberg survey. High prices increase the cost outlook for consumers including jeans maker Levi Strauss & Co. and Carter’s Inc., which makes children’s apparel. China’s farmers started shunning the crop in the past few years after prices tumbled from an all-time of $2.197 reached in 2011, when a Texas drought shriveled crops. Futures are still trading about 65 percent below the record. As Chinese output dropped, domestic prices started trading above world levels. That was a major blow, since the country is the world’s No. 1 consumer. The government responded by starting to unwind its huge stockpiles through auctions. That influx of supply can help to limit price gains. The sales could last another one to two years and could start earlier next year to help ease supply concerns from textile mills, said Xi Jin, manager of monitoring system and international cooperation with the China National Cotton Information Center. The Chinese auctions just supply domestic consumers, and crop problems for other growers will mean that global supplies will be tight. World inventories will probably be smaller than the USDA estimated last month because of dryness in India and the U.S., the world’s top exporter, a Bloomberg survey showed. The agency will update its global outlook on Aug. 12. For more on the Bloomberg supply survey, click here. Output in India may drop to an eight-year low amid dry weather in its top-producing region, Gujarat, and as the waning effectiveness of genetically-modified cotton prompts some farmers to switch crops. The country’s production will decline about 10 percent in the season starting Oct. 1, according to K.R. Kranthi, director at the state-run Central Institute for Cotton Research. Kelli Merritt, a fourth-generation cotton grower in Lamesa, Texas, is optimistic about further price gains as crop concerns mount for her state, the No. 1 U.S. grower. Recent dryness has pushed soil moisture about 1 foot beneath the surface for her cotton planted in dryland on her 1,500 acres. About 350 of her acres are drip-irrigated and the rest is dryland.